It’s been a while since we’ve given an update on bike storage. We’ve been busy, and things can move slowly in this world of Redbrickers and housing associations – but there has been some movement! The Hunmanby bike cage has been launched; everyone on the evens side of Hunmanby has got a letter from City South on applying for a key. Like the Humberstone bike shed, which is now overflowing, initial uptake has been slow. Unfortunately this has meant that the CSM funding for a second cage – dependent on high demand being there – is no longer available. So, do encourage residents near there to get using it, so we can get more! The Humberstone bike shed is over-flowing and other residents are asking for space in it. So please, if you’ve a bike in there that you don’t use much, move it to somewhere else. Until there’s some movement here, CSM won’t consider putting in more provision on Humberstone. On Rockdove there’s more space in blocks and there doesn’t seem at the moment to be extra demand beyond the Sheffield stands we’ve got put in. At the ends of blocks, on Hulme and Clarendon Streets, there’s little space for bike stands and heads have been scratched but not got much further to a solution – ideas welcome. We’re still waiting on the Sheffield stands to be adjusted by CSM’s contractors, so that they aren’t right up against the wall to give more space for more bikes to be attached, and then further secured. 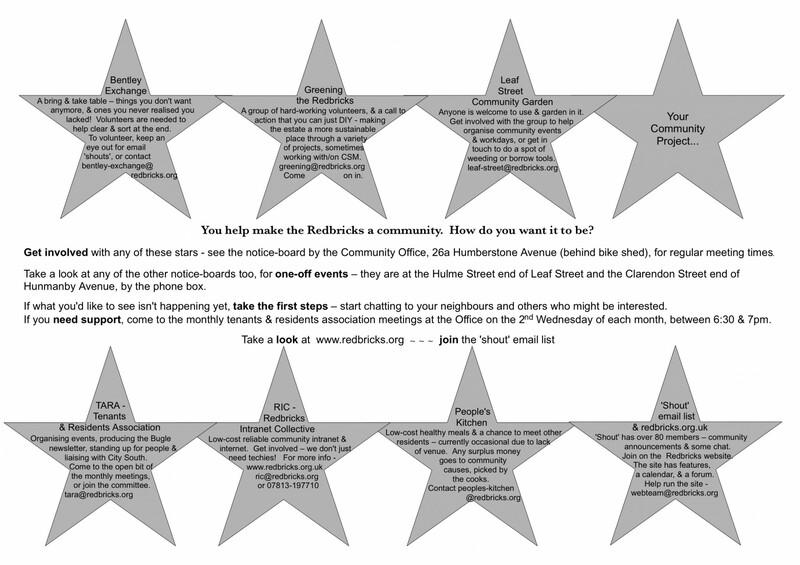 there are a few spaces left on the upcoming Redbricks bicycle maintenance training courses. The course dates have yet to be finalised, but are likely to be three Fridays in a row from mid-end of February. Participation in the course will cover all basic aspects of bicycle maintenance including stripping and rebuilding a basic bicycle. Participation in the course is free, in terms of money, but you would be asked to commit to helping run the Bentley Bike Club, which runs on the first Sunday afternoon of the month from 1 – 5pm. For further info or to book a place please get back to me (at bike-clubATredbricksDOTorg). Places are limited.